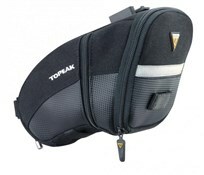 The Topeak Aero Wedge has an aerodynamic styling, perfect for spare tubes, puncture kits and trail tools. It is a good saddlebag and I have used it for a couple of months. I would recommend it because it doesn't seem to let in water when it rains and it fits an inner tube, a multi tool and tyre levers and a thin rain mac folded up. This has lived up to my expectations i wanted a saddlebag that i could fit easily and remove.It takes those important essentials i needed. Plus the rear light clip attachment does hold a rear light securely when it's fitted with the correct accessory clip. What's important is the rear light is held at the correct angle. It also has a reflective band . Quality is good. A quality product with great features. It holds a spare tube puncture repair kit a couple of tyre levers a multi tool a coiled bike lock and a small snack bar together with a mobile phone in the neat mesh pocket in the rear flap. All this without using the expanding section! Very easy to clip on and off. A great fit below the saddle. Like the title says this is a great product. Large enough for most vital accessories.